1. She has the MOST ADORABLE German accent. 2. She is kind – the most generous person I have ever known. 3. She is fierce – strong, independent, intelligent, and naturally commands the greatest respect. 4. She loves desserts – I definitely got my sweet tooth from her (and my dad)! 5. It is not easy to say “No” to Oma – in fact, it is nearly impossible. So, there you have it, one of the most wonderful women I will ever know in a nutshell. And she was coming to my house for dinner. I had to make it perfect, not for me but for Oma. I wanted her to have a memory to cherish for a lifetime. First and foremost, we have an island with barstools that serves as a dinner table. There was no way in heck Ben and I were going to hoist Oma & Opa up onto the bar stools to eat dinner – what a site that would have been! HA! I am seriously laughing out loud at the thought of it! Instead, I headed out to the garage and grabbed our camping table. I pushed the island against the wall and set up our foldable table right in the middle of the kitchen. I then headed over to my parents house to borrow some comfy dining chairs (I know how much Opa appreciates a good cushion!) and a tablecloth. I can’t believe I don’t own a tablecloth?! Once the table was complete with chairs and said cloth, I set it with all the essentials – plates, bowls, napkins, silverware, wine glasses, and fresh flowers. Now, all I needed was some food! For the menu I was thinking warm, rustic, and homey. It was a cool, overcast day filled with a constant Seattle drizzle. I wanted the meal to be inviting, one that made my Oma & Opa never want to leave. I ended up pulling together the following and to be honest, I never wanted the meal (or the leftovers) to end!! Because both the soup and the French Bread require some of my flour blends and as you know, I am still working on bringing those to market(!! ), I thought I’d share the Cream of Leek + Mushroom Salmon recipe with you today. It is FABULOUS!! Gluten free, of course, and super easy! Plus, you can prepare it ahead of time and place it in your refrigerator until you are ready to bake it! Oma called the next day to tell me how marvelous their evening was. She said she felt “special and spoiled” which she should always; she is the best Oma the world has ever seen!! I am so glad she thoroughly enjoyed our evening together because it is one I will never forget. I promise, if you share this recipe with loved ones, it will only make it that much better! Preheat oven 400F. Place two 12” square sheets of parchment paper on work surface. Place leeks in a sauté pan with 3 Tbsp of water and bring to a boil. Cook until all water has been absorbed/evaporated. Add mushrooms, pepper, salt, and butter. 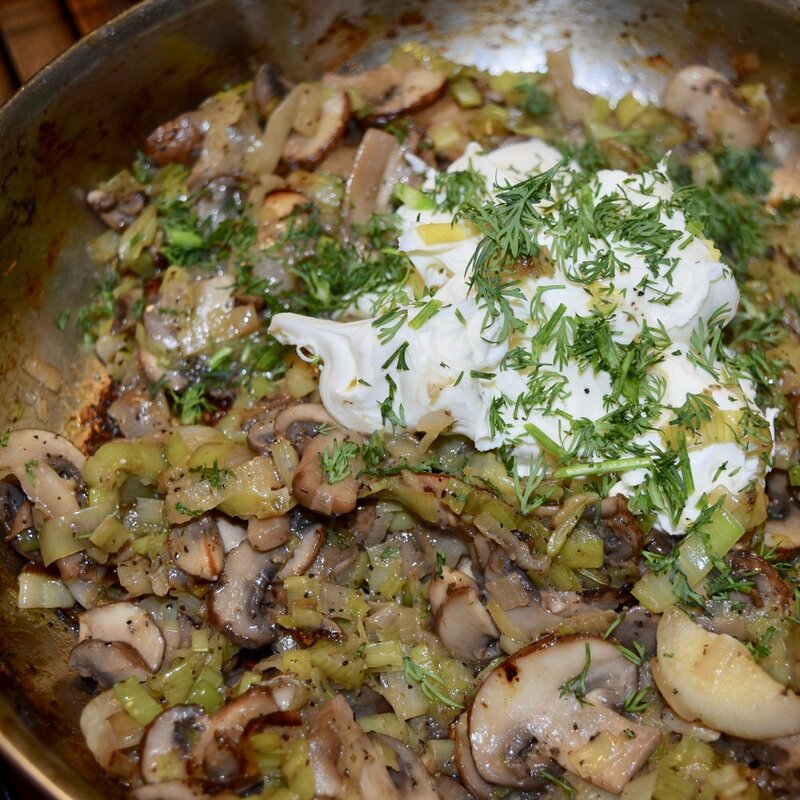 Sauté until mushrooms loose all of their liquid and start to turn golden brown, leeks will also turn golden in color. Remove from heat and stir in mascarpone and 1 Tbsp dill. 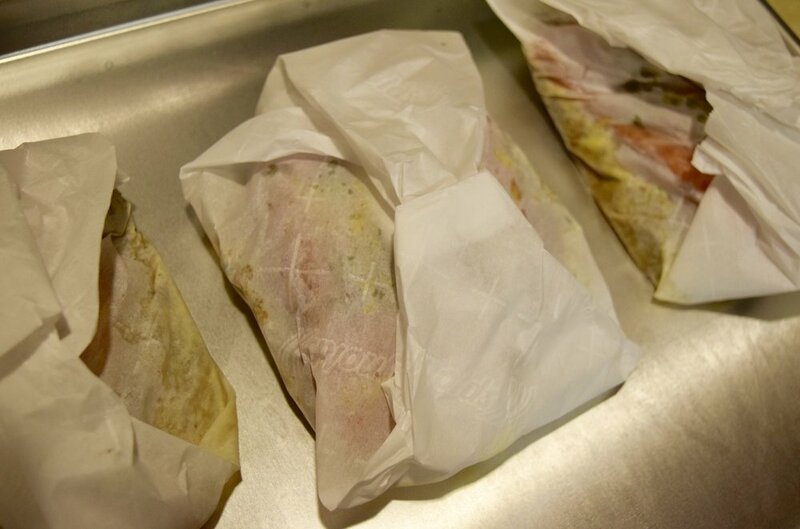 Divide the leek + mushroom mixture in half, placing each portion into the middle of each parchment. Spread to cover center of parchment, just wide enough for salmon to cover nearly entirely – some may stick out from sides, this is totally okay. Place salmon skin down on leeks. Sprinkle each with ¼ lemon zest and then juice ¼ lemon on top of each salmon. 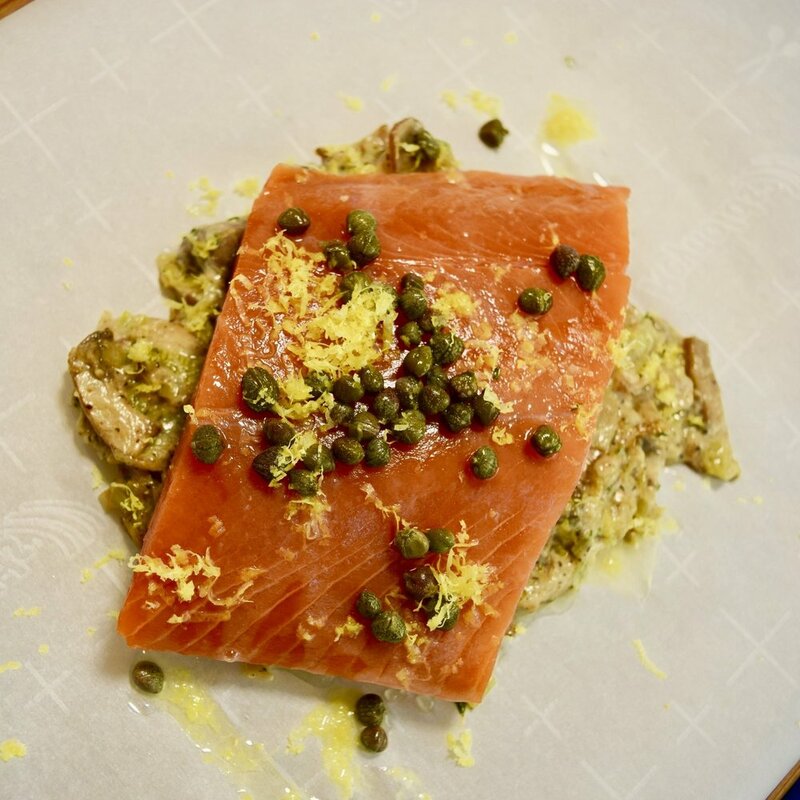 Sprinkle 2 tsp of capers on top of each salmon and then finish by sprinkling remaining dill evenly between filets. Seal the parchment packages by bringing two opposite corners together and folding them over each other several times. Then bring the remaining two corners together and again, fold them over each other several times until the package is sealed.